David Schooff has shaped the community through his wide-angle view of the region’s commercial real estate market as President of Coldwell Banker Commercial, Fisher Group. Those are the three catchwords that are at the heart of an aggressive new nationwide branding campaign for Coldwell Banker Commercial. They are also words that perfectly describe the man at the helm of the local Coldwell Banker Commercial office: Dave Schooff of CBC Fisher Group. “Commercial to the Core” is the expression being embraced by the company. Schooff takes it one step further. In fact, he might best be described as Community to the Core. Although he grew up in Illinois and attended college in Iowa, Schooff has spent much of his adult life shaping the Mankato community, in one way or the other, through his professional and personal pursuits. Drive. Schooff grew up in a small-business environment, learning from those around him at an early age. That fostered a drive in him to pursue his own ventures. He leveraged that early foundation in his numerous business and real estate investments in hospitality, commercial property and workforce housing. All while ensuring his endeavors would have a positive economic impact on growth within the state of Minnesota. Passion. Schooff’s passion comes from a deeply rooted personal belief that to truly succeed you must invest in your community. That’s why he commits his talent, time and treasure to numerous area nonprofits. His passion is helping his community. Schooff has served, and in some cases still serves, on several local and statewide nonprofit boards including the Mankato Area Foundation, Junior Achievement, City Center Partnership, and Minnesota Chamber of Commerce Leadership program among others. Feeding Our Communities Partners is another organization Schooff feels strongly about. Its flagship program, the BackPack Food Program, is one that Schooff believes is truly making a difference in fighting hunger in our community. He brings that passion to his professional life as well. Since coming to Mankato, he’s proven himself a leader in the community. He initially served as President and CEO of the Greater Mankato Chamber and Convention and Visitor’s Bureau, taking over the helm there in 2001. It was a five-year stint in which Schooff built the organization into a significant community and economic development force. He led the business community by creating strong programming in the areas of community marketing, leadership, workforce development, housing development, public policy and tourism. At the five-year mark, he saw a new opportunity with CBC Fisher Group and took it. And that began a journey of leading the community in a different way. Not necessarily having a lot of real estate experience, Schooff tapped into his expertise in urban planning to help CBC Fisher Group grow the southern Minnesota region’s commercial development. Instinct. Schooff brings his business instinct with him every day to the office. In his role as President, Broker and Owner of Coldwell Banker Commercial Fisher Group, Schooff manages day-to-day operations including business growth opportunities in the areas of commercial real estate brokerage, commercial development and property management. In addition, Schooff has long served as adjunct faculty at Minnesota State University-Mankato in the Urban and Regional Studies department where he has instructed courses on community leadership, service learning, economic development and downtown revitalization. Schooff though is quick to point out that while he takes a lead role, he and CBC Fisher Group, would not be what it is today without everyone in the organization fulfilling their role. The company’s new brand, Commercial to the Core, embodies the team as a whole. Schooff talks now about his role in the community on a professional and personal level, and gives us an inside look into the commercial real estate market. Please tell me a little bit about your background; where you grew up, your education. I actually grew up in Northwestern Illinois in a small community called Freeport, about an hour and a half outside of Chicago. I attended Iowa State University in Ames where I received a Bachelor’s of Science in Journalism and Mass Communications with a minor in Business. I went on to earn a Master’s of Science in Community and Regional Planning. With a Masters in Community and Regional Planning, how did you end up with Coldwell Banker Commercial Fisher Group? My initial career after receiving my master’s led to me to the chamber of commerce/economic development industry. After working in a few communities in Iowa, I was hired to be the Mankato Area Chamber and Convention Bureau President/CEO in 2001. Five years later, my wife and I were visiting with Curt and Debbie Fisher at their home. I remember it was over apple crisp that we started talking about the opportunity for me to join Curt’s business, CBC Fisher Group. As a side note, I would like to say that Debbie makes amazing apple crisp! At that time, Curt was looking for a day-to-day operational exit strategy, but at the same time he wanted to expand the business. My wife Michele and I both grew up in small, family-owned businesses so the possibility was very intriguing to me. We considered it and I made the move. At that time you didn’t really have any real estate experience. So what different roles have you played there? What is your role now? Since day one, I have been president of the company; however, my commercial real estate experiences were definitely not as extensive as they are today. The commercial real estate industry offers some exceptional continuing education and certification programs which has been an extremely beneficial learning opportunity. In 2011, I earned the CCIM designation (Certified Commercial Investment Member) and in 2015, the SIOR designation (Society of Industrial and Office Realtors) which is the highest designation in this industry. I have been awarded the #1 Broker in Minnesota by CBC corporate twice and have achieved platinum level status which is determined by gross sales in commercial transactions. Now you are not only president, but also an owner. Yes, there are now three owners of the firm: Terri Goebel who has been with the company for 22 years and does an excellent job of overseeing most of our property management and financial operations; Curt remains a minority owner and an excellent advisor given his long history with the company and his extensive experience in the industry; then myself. What services does CBC Fisher Group provide? We are a full service real estate brokerage firm that focuses exclusively on commercial real estate transactions, all aspects of property management and real estate development. Recently, we have grown our agent base to nine, adding four within the last two years, as well expanding into business brokerage functions. What is the geographic area that you serve? Our focus geographically is south central Minnesota, primarily based in Greater Mankato. In 2016 our office was awarded the #1 franchise office in Minnesota by Coldwell Banker Commercial corporate. We are very proud of this accomplishment. What makes CBC Fisher Group different from others in your industry? Good question. Our firm has been in existence for more than 45 years in one regional center and our history and knowledge is second to none. We utilize advanced technology and marketing to promote our listings, our agents collectively have more than 170 years of commercial real estate experience and, as a CBC affiliate, we have access to more than 4,000 commercial professionals worldwide. Our firm has been a driving force in how this region has developed. We are persistent in looking for investors and developers to continue our momentum. You just mentioned that CBC Fisher Group has been a driving force in how this region developed. I would certainly agree. So, how closely does CBC work with city and other community planners when determining how to develop certain properties? We work closely with community leaders and planners. Many times we have clients, or we provide advice to clients, on concepts and ideas on how to best position a property for development or use. Over the years, we have participated and developed conceptual plans for how areas on the east infill district should be completed. We have been instrumental in some of the recent revitalization in Old Town. There are some very forward-thinking plans coming for the former quarries just north of the Riverfront Drive and Madison Avenue intersection that we are working on that will be unveiled later this year. We reach beyond just Mankato and North Mankato. We have done similar planning and projects in St. Peter and Fairmont among other places. How is the local market? Was 2016 a good year? Many people don’t realize that we usually see projects come to fruition before they become public. So while 2016 was a good year, 2015 was actually better for our firm. Can you explain a little bit about your process? We handle all varieties of clients/customers. Our clients are those who have listed a property on the market with us. This could be anything from a for sale property to a building for lease. Our goal is finding a solution for their property so we are trying to match a buyer and tenant. Therefore, we may have a business that would make a good fit into a commercial space for lease. There are investment properties that we represent as well. Finding interested investors comes from many avenues. As you can imagine there are a variety of prices and types. Occasionally, we bring together a group of individuals as an investment group. What do you have currently in the works? As much as I would like to be able to discuss projects, we represent many clients and investors who expect confidentiality. I will say that there are some exciting projects being discussed and planned that will continue to broaden the landscape of Greater Mankato where we work and live. That doesn’t mean though that they will become a reality. There is, however, a strong interest within the community for continuing the momentum around the expansion and development of our region. Many tout the region as having a healthy growth, would you agree? Greater Mankato in general is healthy and has been fortunate. However, like any community you can’t rest on your past successes because community development is constantly in competition with every other community in the country. From my perspective, we need to ensure that the business environment remains fair and competitive, as this drives growth and opportunity for all. What trends do you see in your industry in this market? You could probably take each segment of real estate and see the trends. For example, in the office sector in larger markets we have seen some dramatic trends with a migration toward smaller office sizes, more open floor plans, efficiency, etc. Some of this has happened in Greater Mankato and local companies are starting to embrace many national or even global trends. Is demand keeping up with supply or vice versa? Like any business, there are always areas where we could use more inventory, but in some sectors such as the office market, we are saturated. As the needs of our community change, CBC Fisher Group is poised to address those needs. What has been the key to CBC Fisher Group’s longevity in the community? In the beginning, Curt worked hard to develop his brand and relationships. From there, he was able to add good people. We have continued to grow at a pace that allows us to be smart with our company. Our people are the foundation of the company and within our organization, our agents have a wide network of contacts and proven results that foster repeat business. Please talk about your own business ventures outside of CBC Fisher Group. Being in commercial real estate, I am exposed to many investment opportunities. My wife and I have invested in many real estate projects throughout the region from commercial to residential developments. I have a passion for growing the community and investing in projects. The Dunkin’ Donuts investment was a different venture with another partner. We saw a gap in the marketplace and after extensive analysis, decided to pursue the franchise. I continue to look for opportunities to provide more jobs in our community, grow our region on pace with other communities, and fill in gaps where there is demand for products or services. Any advice for someone thinking of getting into investing in commercial property or starting a new business venture? Commercial real estate is a different animal than residential or owning a house. You need to have a professional assist with the process and provide the correct analysis. As much as we try to get all the accurate information occasionally there are situations when every deal is not perfect. Even the best make some mistakes. Commercial is highly driven by the financial analysis which there is a bit of an art to understanding. You really should have a passion as well and I would also recommend that having a professional asset or property manager also makes sense because you want the investment to perform at its best. Investing in commercial real estate is more of a long-term investment strategy and most frequently is part of an individual’s overall investment portfolio. I know that you are not only professionally invested, but also personally very committed to this community. My personal philosophy embodies the importance of giving back to my community. Over the years, I have volunteered my time on many local not-for-profit boards and I am currently serving on the Mankato Area Foundation and the Feeding Our Communities Partners (Backpack Food program) boards. Both my wife Michelle and I believe in the importance of supporting local nonprofits and business owners. We enjoy providing opportunities to others and hope that others will embrace this philosophy. As an example, we both started scholarship funds at our respective high schools through the Mankato Area Foundation, an organization that does a tremendous job in managing our funds and the processes that come with scholarship programs. Michelle’s is in memory of her father, Gary Stroup and mine is an honorary scholarship in the name of my father, Phil Schooff. We both grew up in small business families and it is important to us to help students where we grew up, by contributing to their education and giving back to our high schools. On a more personal level, Michelle and I travel quite a bit as we like to experience different parts of the U.S. and world. I have always been an avid sports fan and still root for my beloved Chicago sports teams. It was pretty amazing to finally watch the Cubs win a World Series last year. Since moving to Minnesota, I have also become a hockey fan which again is fun when the Chicago Blackhawks are winning Stanley Cups. Michelle and I are supporters of Maverick Athletics as well, so we spend a lot of time attending games throughout the year. When the Dunkin’ Donuts franchise put out a call in 2014 that they wanted to return to the Mankato market after a decade away, Schooff paid attention. After researching the possibility and liking what the analysis found, he approached another investor to join him in the venture. Schooff, along with Oliver Schugel, have committed to building three Dunkin’ Donuts locations in Mankato. The first is set to open this year. “We are thrilled to expand the brand’s presence in Mankato and play an important role in the daily lives of people who live, work and visit here,” Schooff said when the deal was first announced. Together, Schooff and Schugel have more than 45 years of experience in real estate and business development. Utilizing Schooff’s knowledge of urban planning, the duo kept the community in mind when choosing a location. The first shop will open on the corner of Madison Avenue and Star Street. The city is touting it as a good fit as it will provide infill development in that area. Dunkin’ Donuts has been around since the 1950s. Its offerings include hot coffee, iced coffee, flavored coffees, lattes, macchiato, espresso, cappuccino, Dunkin’ Donuts K-Cup® pods, Coolatta® frozen drinks, donuts, muffins, bagels, breakfast and bakery sandwiches, and a DDSMART® menu featuring better-for-you items. In April 2016, Coldwell Banker Commercial corporate unveiled an edgy new marketing campaign. This campaign is very different from anything else that’s out there and has received a lot of positive feedback. If you have seen our new commercial on the jumbo-tron downtown at the Verizon Wireless Center then you know what I am referring to. While attending the Global Conference in Florida this past April, I asked Fred Schmidt, President and COO of Coldwell Banker Commercial, why he decided to take such a risk with this campaign. He said he wanted to get people’s attention. He wanted people to pause to process the message. COMMERCIAL TO THE CORE. What does that mean exactly? After visiting with Fred, I now understand that COMMERCIAL TO THE CORE is our ability as commercial real estate agents to exercise our passion, instinct and drive to achieve results for our clients. It’s also our team, our network, our innermost core and all that we strive to accomplish at work for our number one priority – the client. In conjunction with the franchise’s new marketing campaign, CBC Fisher Group has launched a more modern, user- friendly website which keeps visitors up to date with recent growth and development, transactions and community events. We have access to the newest technology to maximize the exposure for each listing, not to mention the ability to network with 4,000 CBC affiliates worldwide. We believe in giving back to the community. Our agents are informed and involved community members and participate in many local events that benefit non-profit organizations in our area, such as Feeding Our Communities Partners, Junior Achievement, Mankato Area Foundation, United Way and the YWCA. Through a recent partnership with Minnesota State University, Mankato, CBC Fisher Group has been able to provide resources which benefit the university’s athletic programs. Fisher Management Company is a full service asset/property management firm which has been protecting and enhancing investments for 40 years. Our team of professionals oversee all aspects of property management including: management of critical financial components of property ownership and tenancy, single point of contact for tenant calls and concerns, bid contracted services and property repairs, preventative maintenance inspections, and 24 hour emergency response. Our relationship with owners, investors, landlords, and tenants has given our company a reputation for service excellence. Our management portfolio includes 40 + properties and nearly 1.2 million square feet of space of office, industrial, retail, and multi-family. Rosie is a matchmaker with integrity. She is skilled in finding the right property and “matching” it to the right people. Having been an owner/operator herself for many years, she understands her clients concerns and goals. Additionally, Rosie is the manager and leasing agent for the Madison East Mall and coordinates all of the onsite tenant leasing, events and activities. Dave strives to understand his clients’ needs and after 37 years in sales, small business and commercial real estate, he finds that their needs are continually changing to adapt to the regional market. “Clients appreciate persistence, perspective and innovation and that is what I am pleased to provide to them.” Throughout his career, Dave has worked with national companies, small businesses and startup businesses and appreciates being able to assist them every step of the way to finding exactly what meets their needs. Jim is passionate about commercial real estate development projects which are often complex, involve a lot of time and multiple parties. “Everything runs much smoother when the focus is on working together,” he says. Each development project has several phases which include site selection, careful analysis, project management, and the opportunity to be very creative with design. His recent industrial and retail projects have been the result of recognizing a demand in the market and an effort to meet that demand. Jeff is based out of Fairmont and has been quite successful in redevelopment of office, industrial and retail buildings in that area and along the I-90 corridor. 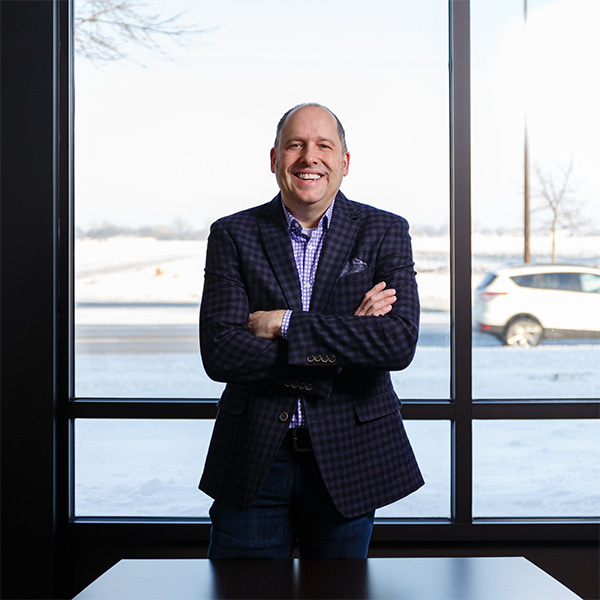 He is the CEO and owner of Tech Builders, Inc., a commercial general contracting firm specializing in hospitality construction for many national franchise restaurants and hotel chains. His extensive business experience in this industry is an asset to clients interested in developing, purchasing and leasing in Southern Minnesota. In 2016, April Femrite joined the firm as a Certified Business Intermediary (CBI). With this designation, she is able to provide professional, knowledgeable representation to clients during the process of selling or buying privately held businesses. Her specialty services include: broker opinion of business value, marketing of the business with confidentiality, screening of potential buyers, facilitate negotiations, manage due diligence investigation, and general coordination of all aspects pertaining to the business sale. She is the only CBI in Southern Minnesota and with her specialized training brings added value to the company by expanding the services we provide to clients. According to the web site, in 1906, Colbert Coldwell founded his real estate company based on the conviction that he knew a better way to do business. Rooted in this entrepreneurial spirit and backed by the global Realogy network, the Coldwell Banker Commercial® organization is still finding better ways to fulfill the commercial real estate needs of investors, owners and tenants today. CBC is comprised of approximately 200 independently owned and operated companies (of which 159 offices are stand-alone Coldwell Banker Commercial offices) and more than 3,000 professionals worldwide. With affiliate companies in over 40 countries, CBC has one of the largest geographic footprints in today’s commercial real estate marketplace. Leaders in their local communities, CBC affiliates have the knowledge and connections necessary to ensure all client needs are met. Whether you are looking for a commercial space for sale or a commercial space for lease, our experts will help find you the perfect property.